Evidently I’m living my life under a rock. I had no idea that gourds could be made into 100 different things and that a person could actually make a living from gourd art. I recently saw some awesome gourds on my friend Penny’s mantel. Since then I have been just a little nuts about gourds. Of course I wanted some gourds of my own so Penny sent me a link to an eBay seller and I bought two. Here they are upon arrival On Sutton Place. *Click HERE for more gourds on eBay. The next step was to stain them. I had some Minwax gel stain so that’s what I used. I applied it with a sponge paint brush. The picture below is after one coat of stain. I thought they might need two coats but I was pleased with the way they looked after one…so I stopped there. Next step was the wax. I managed to get some on one of the gourds but I had a hard time buffing it. It was totally dry but still came off on my rag. I was making a mess of things…so I took them to the garage and sprayed them with a coat of semi-gloss poly. I should have done that in the first place and skipped the wax step. It worked great and was so much easier. Lots of texture…and varying shades of stain. Obviously I can’t quit my day job and take up gourd art. I love them though…and this was a fun, easy and cheap project. When I was messing around with my gourds, my little dog got bored and this is where she ended up. Looks pretty comfy. Update August 2016: I stained these gourds 5 years ago and as you can see from the photo below they still look amazing. I carefully store them in a plastic bin in my basement. I love them as much as the day I wrote this post! I love this idea! Never would have thought to stain gourds. I’m so glad you posted this on G+ today! I have two gourds rolling around in my trunk that someone gave me 2 months ago. Now I can get them ready for fall! the little gourd basket is adorable! yours look lovely too! I am a new follower to your blog. We have a miniature schnauzer too. He loves to make himself a "nest" somewhere. He looks similiar to yours only with cropped ears and a longer, fluffier beard. Aren't they wonderful dogs? I discovered your blog a few weeks ago, and noticed that your home is too attractive. I just had to comment today on the photo of your dog. Too cute. I did a blog about my gourd with your inspiration! Check it out! I'm a new follower and I linked you with my blog! Oh my goodness, I had no idea that gourds could be so beautiful! Yours are lovely, are they dry so they can be stored and used year after year? I hope so. I have a friend who does gourd art and sells them in craft fairs. Yours turned out great! I don't know how you find time to even do those projects and work and blog on top of it all. I have yet to bring out my fall things. Hope I get something done before Christmas! And your little cutie at the end is even more precious. Oh, those are great inspirational ideas. Your gourds turned out very nice too. Your gourds look great. When my granddaughter came for dinner last week, she surprised me with two tiny gourds. She told her mommy she wanted them for Mimi when they were at the local nursery. They're the only ones I have. Do you follow Paula at Sweet Pea? She has a post on how she decorates with gourds. You would enjoy it, I think. I never knew grouds could be used like that, either! I think yours look lovely! Fantastic fall post! It turned out great and gorgeous autumn colours. Thanks for sharing. Grew up with gourds aplenty in my area, so I guess I have taken them for granted! :) -Many great and pretty uses for them, my favorite being the two "Trick or Treat" ones. Thanks for sharing these. First off, let me say that your post was very timely for me. I just found the gourds in my garage that a cousin gave me a year ago. Then I tried to clean them, but they have some black stuff on them that has to be scrubbed off and I didn't get it all off yet. So, anyway, I guess I need to paint them or keep scrubbing so I can display them. I totally understand the juggling issue. I too, have had to cut back on blogging, and am trying to find a good balance. I love love the stained gourds.And as for your post well real life takes precedence over blogging do it when you can and your true followers like me will still be here. Have a a good week! Your gourds are beautiful, now I want some! They turned out great! 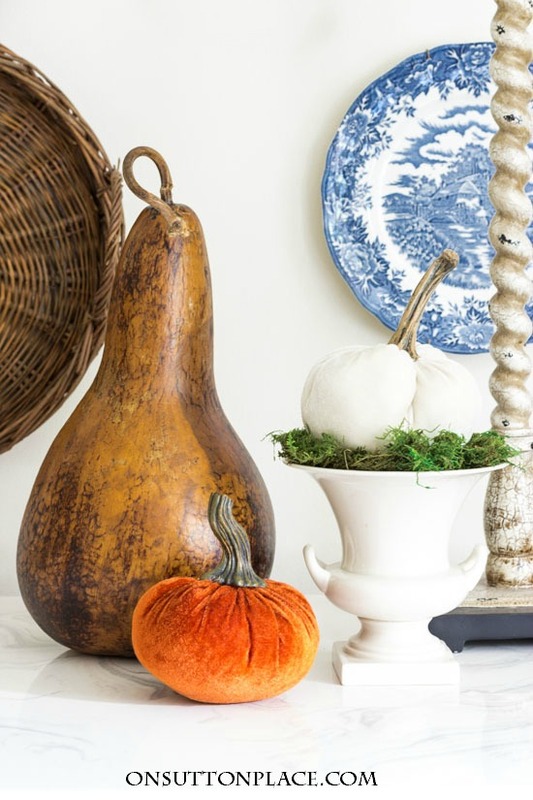 Your gourds are the perfect fall accent…turned out sooo nice! Love your puppy, what a sweet photograph!!! You did an amazing job with the gourds! I never realized how ways they could be used. Beautiful, what you did with the gourds. I love going to fall art shows, because of all the amazing gourds there are. You have shown some great ones. Glad I could be of help with the gourd shopping and staining! Yours turned out beautiful. Oh Ann, I LOVE your gourds!! They turned out so beautiful & you have them displayed perfectly!!! On a side note, I need to tell you how much a love your lantern above your island!!! It adds such warmth & coziness to that spot. Ann, thanks so much for stopping by my blog and leaving such a sweet comment. I would love to ditch the presents and take a vacation. I have been saying that for years. My family looks at me like I'm crazy. lol. Again thanks so much. The gourds look great. I haven't seen any gourds that big in my area. Love your fall decorating. You are truly inspiring. Have a wonderful week ahead. Wow Ann they turned out gorgeous…good job! My sister collects painted ones like the Santa she has them for every holiday! What a fantastic idea Ann. They look so cute too. I have a gourd bird house, I bought long ago, I had no idea what exactly it was, but I loved it. Have a great day. You should get that print from Laurie, it is so so charming. I loved this post. 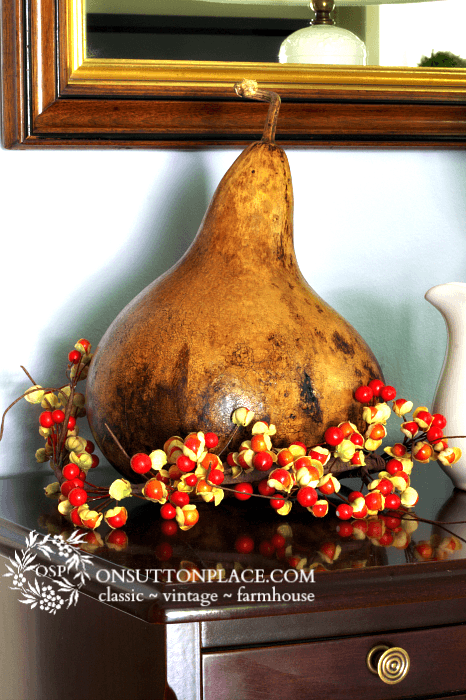 I have a gourd that I found at Goodwill and had no idea what to do with it…..until I read this post!! Thanks for the idea! I'm a new follower!! Wow I had no idea either. I love the bowl one. Yours looks so great sitting on the table. Perfect for this time of the year. That Santa gourd is so cute! What a great way to decorate…I wish it was Fall over here! Ah – gourds! Yes, I'm familiar with them and have painted a few (I did a blog post in September, if you care to take a look – called Gourd-eous Gourds for Fall.) There are some very talented gourd artists out there (but I don't count myself among them!) I do it just for fun. I think yours turned out great! It does get kind of addictive, so watch out! Nice to meet you! Ann, you did a beautiful job on your gourds!! They look great. We have two that an artist did and I love them! Great inspirations. I love the way yours came out and the way you have displayed them. Your gourds are just beautiful. I love how the finish brings out their texture. So simple and pretty. You are way ahead of me! I just put a collection of small gourds into a wooden bowl and called it a display! What great ideas they have shown us! I love them all. Your gourds turned out wonderful…thanks for the tip on the lacquer. They are gourd geous! :) Great job! Now will they be preserved for many years???????? They turned out beautiful. You chose the right stain combination for sure. I didn't even know you could buy a gourd on Ebay. Would it be silly of me to say that your gourds are "gorgeous"?! Ha! Well they are. I really like how you changed the look of them. Now, you can use them all the way through Thanksgiving and each year thereafter. Your little dog is soooo cute! I like that pretty yellow and white pillow he's sleeping with too. Oh yes, gourds can be an artist's dream! Thanks for sharing all the ideas! Yours turned out great! I discovered your blog a few weeks ago, and love your home. I just had to comment today on the photo of your dog. Way too cute! I like your gourds and the way you placed them adds just that spark of fall in the right way. I learned this week that if you paint gourds white and drill a small hole bluebirds love to eat the seeds. Don't know why you should paint them white. I can't post more than once or twice in a good week either. How does everybody do it and life inbetween? 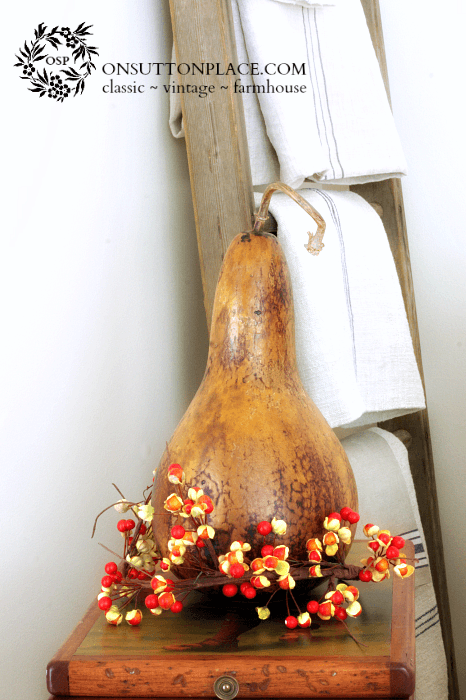 The gourds are lovely…they look great right where you put them! I think the gourds turned out really pretty. i haven't tried mine, maybe i'll put that on my to do list this weekend. I really like yours! Your little dog is soooo cute; she looks mighty comfy! you did a lovely job of your gords,, I love them, I think they add such a raw natural element to our homes, what a sweet doggie,, looks great in yellow! Great ideas, Ann! The ones you did turned out so nice. I have an "ancient" coconut picked up by my little boy (now grown) while it as green with the outer covering on it. I set it where is would dry out, the more it dryed the more character it had, turning completely brown. I gave it a nice coat of shellac and still have it and use it in my decor. It's just a part of me. I've always admired gourd art. We have one piece. Last year I threw some decorative gourds in the compost bin, and they came up in the spring. I transferred them to the garden, and I had tons of small gourds. Love how you stained and displayed yours. I had to laugh because when you showed us the sneak peak at those babies, I thought they were pears, lol. I love your stained look and that last gourd art photo is gorgeous. Stunning. I knew about the bird feeders but you've found so many other gorgeous pieces too. Love what you produced and you've made it so simple. I guess I'm living under that same rock, Ann, because I had no idea that people turned gourds into works of art. The bucket one looks just like wood- amazing! The gourds you stained turned out so well… you must be really pleased at how great they look. I have to tell you how beautifully the yellow quilt photographed. I really want a yellow quilt now! Ann, I love all the gourd ideas. I like the last one the best, too. What a great piece. Your gourds turned out great. I will probably stain my three smaller ones that Babs gave me now that they have dried out and turned colors.